I'll admit I'm still trying to figure out what Jack Kirby was trying to do with the New Gods. Once I got past some of the goofy names, I realized there was a lot of interesting stuff going on. My impression of his overall project is that he was attempting to create a modern mythos for our times, a contemporary update of the Greek and Viking pantheons with a distinctly American flavor - a sort of American Iliad. I think the problem was that this pantheon of American gods was already established. Their names were Superman, Batman, Wonder Woman, Spider-man, Captain America, the Fantastic Four. Of course, Kirby had an integral role in creating that pantheon. But I think readers - particularly readers of mainstream superhero comics - weren't prepared for the motley crew of new superheroes introduced in the Fourth World comics. Of course, that's only my interpretation of Kirby's project, and I could be way off the mark. But I do think it might have worked better if Kirby hadn't worked the other DC superheroes into the story (whether he wanted to or had to per DC's order, I don't know). It's hard to be impressed by a brand-new character like Orion, no matter how powerful he is, when Superman's been juggling planets for years. Even Darkseid didn't gain the prominence he now has until after decades of stories. Of all the New Gods characters though, I find Mister Miracle one of the oddest. He doesn't quite fit the mythos. He's more of a traditional superhero, right down to his name, look, and origin story. 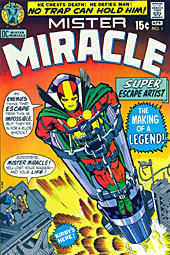 Writers like Grant Morrison later helped define Miracle's place in the New Gods world, but initially he seemed to stick out like a sore thumb against the galaxy-spanning adventures of the New Gods. Here's this guy with access to godlike technology (a Mother Box), and he comes to Earth, catches an episode of Mindfreak and says, "That's what I want to do with my life"? MM uses the "slender but buff" body, which is fitting for a more athletic type like Scott. 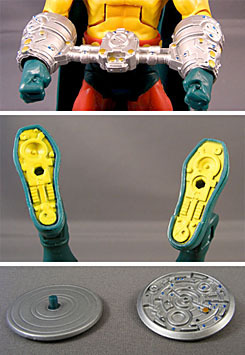 The unique tooling is the head, which is sculpted around the edges of his mask; his cape and clasp, which is shared with Dr. Impossible; his belt; his gauntlets; and his boots, which also have some awesome Kirby-esque techno detailing on the soles - a great little touch. Mister Miracle is yet another victim of the dreaded RPS - Red Plastic Syndrome - whereby, due to the nature of red molded plastic, the figure looks very toy-like. I realized this is largely due to a certain translucent quality to the plastic, visible around places like the narrow edges where the torso meets the shoulder joints. 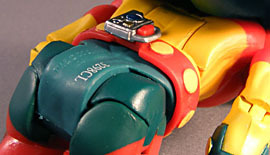 There's not much slop on my figure, but Mattel is still having issues getting painted parts (such as the green sides of MM's briefs) to match molded parts such as his groin, which is molded in green. I don't find it too noticeable except in bright light, but they could do better. His cape is also molded in green plastic, and for whatever reason, it's incredibly stiff. I thought Mattel was working on more pliable capes? Dr. Impossible and Superman have relatively flexible capes, but Mister Miracle seems to have soaked his in starch for a week, then had it lacquered. He has all the standard DCU articulation, and I had no stuck joints issues - but the thick cape does block some motion. Accessories are always a crapshoot with DCU Classics - some characters get no accessories at all, others get a cornucopia. MM is one of the latter. He's got a pair of high-tech handcuffs which can be slipped over his wrists, a Mother Box which attaches to his belt, and a pair of hover discs that fit into the pegs on his feet. They all have a Kirby-esque look to them, and each of them has at least one paint application. The discs appear to have been molded in green plastic and then painted silver. Unfortunately, Mister Miracle can't hold the Mother Box, because he doesn't have an open hand. Which is odd; MM isn't exactly known for being a bruiser. If I were a wealthy man, I might tempted to track down an extra classic Aquaman and do a hand swap. The figure also includes the same BAF Kalibak piece as his twin/variant, the right leg. 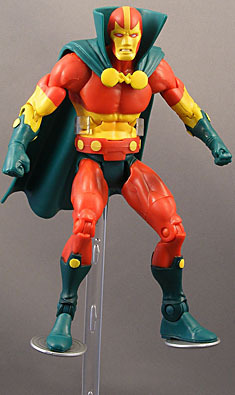 Thanks to his awesome accessories and extra unique tooling, Mister Miracle is quite a bit better than his evil twin Dr. Impossible - which is probably as it should be.